The Yellowstone ‘super volcano’ is a mega disaster eruption just waiting to happen. And if that isn’t enough to capture your attention, it has been revealed that Yellowstone’s underground volcanic plumbing is much bigger and better connected than scientists previously thought. Yellowstone National Park includes one of Earth’s largest volcanic-hydrothermal fields, and has an absolutely enormous caldera. Over the past 2.1 million years Yellowstone volcano has had three immense explosive volcanic eruptions, each with an enormous outpouring of magma and as much as 1,500 cubic miles of ash and debris which covered North America. What has happened there in the past is nearly unimaginable. While no-one knows for sure, we are now living near the edge of the shortest estimated time span of the Yellowstone eruption cycle. It has been 640,000 years. 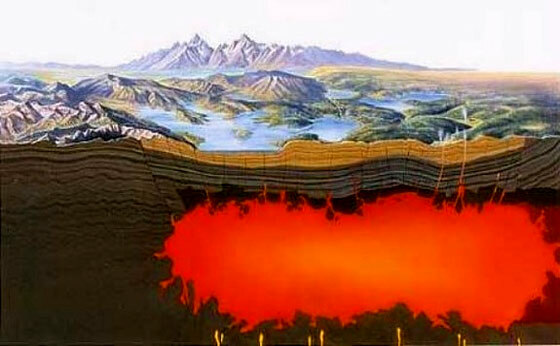 Yellowstone eruption history: 2.1 million, 1.3 million, 0.64 million years ago. Having said that, it could still be a very long time until it erupts again. Geophysical events such as this move slow, however once they begin, it is extraordinarily fast. During the 2013 annual meeting of the ‘Seismological Society of America’ held in Salt Lake Utah, and during meeting sessions including ‘Volcano Characterization and Related Hazards’, new outlooks were revealed as data from modernized earthquake and GPS monitoring networks provided new key information for probabilities and assessments. According to a livescience.com report of the Salt Lake event, Jamie Farrell, a seismology graduate student of the University of Utah, had participated in a study and re-analysis of cataloged data of the Yellowstone region using modern techniques. The Yellowstone region is monitored by the University of Utah which records and processes data from a network of 71 GPS stations in the Yellowstone volcanic field. Some of the geophysical hazards that we face are beyond preparedness if you live too close. For others though, there’s always a chance of survival. 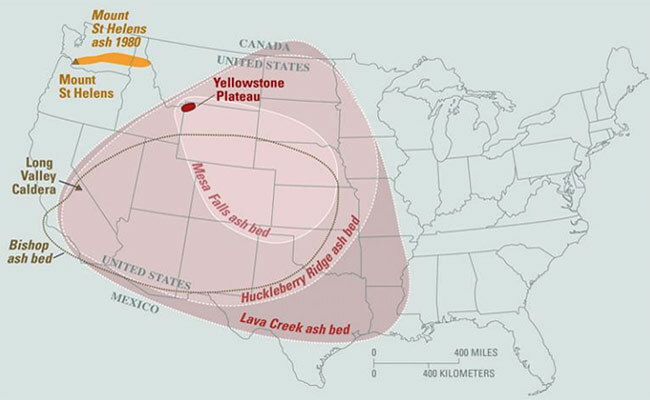 In the event of a Yellowstone super volcano eruption, although the entire planet will be affected, here in the U.S. many of the western and central regions will be horribly affected by deep ash while many eastern regions will fare better. Much depends on prevailing winds regarding the worst ash-fall. The ground will be covered with ash; the sun will be dimmed for at least a year or more; both of which will result in massive crop failure. How Bad Would A Yellowstone Eruption Be?. It is advisable to understand the risks that are around you – even those that may seem unlikely to occur. Just remember this – just because something has NOT happened in our lifetime does NOT mean that it never will. It could come like a thief in the night. As of this post there has been very high earthquake activity in the Yellowstone region of late, as well us ground uplift as indicated in the following chart from the USGS. The following video of Bison leaving the Yellowstone region appears to be alarming in that many people believe that animals leave an area prior to a major geophysical event. The USGS has published information on their website downplaying this possibility regarding this video. When you view the video note the activity at the 10 o’clock position of the video at the beginning. it is up on the foot of the mountain. It appears to be some kind of steam(?) or maybe an hydrology event. The snow is discolored and this maybe the reason the buffalo are on the move. Do you mean the park? I think the place itself will survive. Perhaps prosper without those pesky tourists. Why, oh why, could there not be giant, ready-to-blow caldera right under DC?